Carrying a weapon brings up safety issues, whether it is being used or simply attached to a holster. In sport, military or law enforcement, all holsters have one thing in common. They must have proper fit in order to ensure safety and security of the gun they hold. Simply put, if a holster doesn't fit properly, the gun will fall out, misfire or both. Angles: Each person has a different way of drawing a weapon. Some prefer a straight-up approach, while others prefer a forward or backward angle. 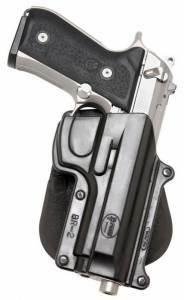 All holsters are specifically designed with release angle in mind. In order for the retention feature to work, however, it must fit the weapon properly. Otherwise it may come out creating safety issues for the user and anyone nearby. Styles: Holsters can be worn in any number of places on the body. Whether positioned on the inside or outside of the waistband or worn on the belt loop the gun should fit properly and securely. The shoulder and thigh holster styles require a tight, comfortable fit despite lots of movement during tactical operations. 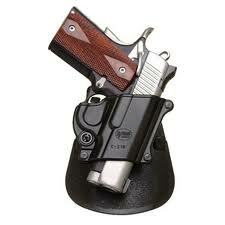 For concealed carry holsters the fit of the weapon inside the holster and the holster to the person are crucial. While the main idea is for no one to know the user is carrying a weapon, safety is important as well. Adjustable straps and various sizes allow for concealment and swift removal custom fit to the person wearing it. Outside Elements: Correct holster fit can be affected by materials that react to heat, cold and moisture. Materials like carbon fiber composite and nylon are durable and unaffected by the elements. Leather is reliable, but can become worn after extended use and abuse if not properly cared for. Manufacturers: Holsters that fit a weapon correctly are molded to each manufacturer's exact specifications. Glocks and Berettas for example, will not fit a holster made for a Ruger and vice-versa. 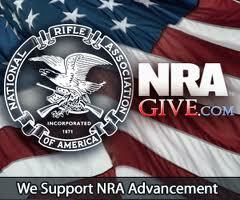 Reputable dealers are able to supply nearly any type of weapon equipment according to the make and model of the gun. When the exact maker is not specified, the shape and measurements of the barrel can be used to create the proper fit. Hand Use: About 13% of the population is left-handed. When it comes to using holsters, which hand a weapon is drawn with makes a difference in handling and fit. Those specially designed for left-handed people take into account the weapon's shape as well as what part of the body it is kept on. A shoulder strap, for example, must be reachable on the forward side of the body, whether the user is right-handed or left-handed. Otherwise, they would have to cross awkwardly to fasten and unfasten the straps.